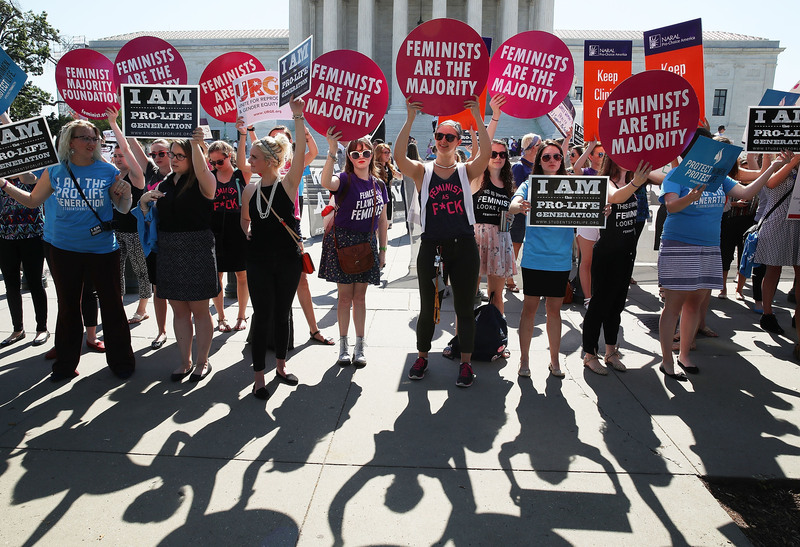 The Supreme Court is expected to announce its decision on Texas abortion bill HB2 on Monday, which could either defend or detrimentally damage women's right to access abortion care. Pro-choice advocates have fought tooth and nail to get the bill struck down for the past three years, supported by medical experts from the American Medical Association, the American Academy of Family Physicians, and the American College of Obstetricians and Gynecologists who declared the law "unnecessary" and "harmful". The culmination of all that work should show on Monday morning, carried by the famous Supreme Court runners who could carry a truly life changing decision down from the court. Whole Women's Health v. Hellerstadt is a challenge of Texas House Bill 2, an anti-abortion measure that closed over half of the state's abortion clinics. The law mandates that abortion providers comply to costly and restrictive requirements, like requiring abortion providers to have admitting privileges at nearby hospitals and having surgical grade equipment within their offices. But supporters of the original bill claim it will protect women and make abortion care safer. Depending on which side wins the case, nationwide access to abortion care could look radical different in a very short time. It’s absolutely critical to understand how the decision could affect the country, so here are seven important facts to help you interpret the court’s decision. The proponents of the bill claim that the measures it outlines claim that these are necessary for women's protection to keep them safe. Yet the death rate from a legally induced abortion is already 0.6 deaths per 100,000 abortions, which is 25 times smaller than the death rate of women who die in childbirth. People who support the bill are just trying to make circumstances so costly and unattainable that clinics across the country will close, and it's already working. Because so many clinics, especially those in rural areas, have closed, some women now live hundreds of miles away from their nearest clinic. For the 38 percent of Texas women whose nearest clinic closed, the average distance they had to travel to get to the next closest clinic was 85 miles. There's an entire non-profit dedicated to helping women pay for travel expenses associated with accessing abortion care but there are still many more who can't get to a clinic. Those women who can't afford to travel are still desperate to have an abortion, so they're turning to significantly more dangerous, at home methods. Researchers estimate that between 100,000 and 240,000 Texas women have self-induced abortions before, and that number is expected to grow because of HB2, using methods like hitting their stomachs with meat tenderizers and swallowing lye. Abortion isn't always the "selfish" choice of a promiscuous woman that opponents make it out to be. Women need life-saving abortions every day, due to health risks like infections, heart disease, and preeclampsya that can make pregnancy deadly. These nuances often aren't addressed in the restrictive new abortion laws, and could ultimately lead to preventable deaths. Freakonomics introduced the world to the Donohue-Levitt hypothesis, which attributes the drop in crime during the late 1990s to the passage of Roe v. Wade . States with high abortion rates had a 30 percent drop in crime relative to states with low abortion rates, because less children were born into vulnerable circumstances, such as poverty and teen motherhood. Although this hypothesis can't truly be proven, it's a compelling argument for the safe and legal access of abortion for all women, especially those who are often the most disadvantaged by restrictive laws. Abortion laws are getting more invasive and more restrictive than ever. In Texas, women are forced to have an ultrasound, listen to a speech on the sanctity of life, and endure a 24-hour waiting period before getting an abortion. John Kasich signed a bill in Ohio that prevents clinics from providing abortions without a patient transfer agreement with a local hospital, and prevents public hospitals from entering into those agreements with clinics. Kansas passed a bill that requires providers to tell patients that abortion links to breast cancer, even though it's completely untrue. These are extremely restrictive and truly manipulative ways to prevent women from accessing simple care, and they are only continuing to roll through state legislatures. State laws can only be changed either by the Supreme Court or by the voters, and realistically, it takes way too long for SCOTUS to change things (HB2 was enacted three years ago.) Voting pro-choice advocates into office is the fastest and most efficient way for things to change, but it's still a huge challenge to make that happen. The Whole Women's Health v. Hellerstadt case could have a huge ripple effect on abortion access in the U.S., so it's absolutely vital to understand why this case decision is made. These important facts should give you a starting place for building your interpretation of the ruling, and how to potentially start changing it if need be.